Do you know your Recycling Logos? We all want to do what we can to protect the environment for the generations to come, but it is important that we do it correctly. The list of recycling logos can be confusing. It is important we know what each of them mean so that we can be sure we are recycling our waste in the right way. To learn what is allowed and not allowed in your Barna Recycling Blue Bin, follow this link ‘What Goes in my Blue Bin?’. The list of recycling logos can be confusing. It is important we know what each of them mean so that we can be sure we are recycling our waste in the right way. Below is a list of common recycling logos with their recycling explanation found on the Repak.ie website. Free Bin Collection for 12 Months! Congratulations to Alan Shattock from Clifden who recently won 12 months free bin collection from Barna Recycling having entered a draw on sign up for a Pay by Weight package! Alan is pictured here with Mary Booth from Barna Recycling. Don’t forget to keep an eye on our blog to hear all about our upcoming competitions and offers. Repak Ireland are on a mission to ‘Save our Nation from Contamination’. This week is all about understanding contamination when recycling. Contamination happens when non-recyclable items are mixed with recyclable items. 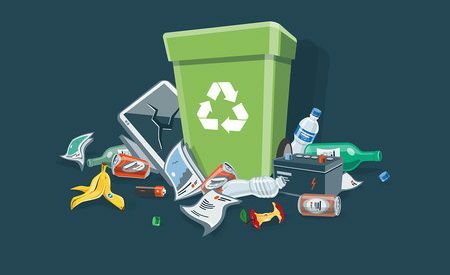 According to Repak.ie over 169,000 tonnes of plastic packaging waste are generated per year in Ireland and due to contamination only 36% of plastics are actually recycled.